The big news for NXPconnects attendees last week wasn't the scorching heat wave running through San Jose, rather it was the announcements, demos, and talks surrounding autonomous vehicles. Visitors to our booth were treated to our stunning 3D automotive cluster demo running on the NXP i.MX6QuadPlus, along with other examples of how we accelerate and improve user interface (UI) development. People were immediately hooked by taking a design to target quickly and it led to questions about what platforms we support (everything from MCUs to MPUs, with little compromise in UI features) and production readiness (every deployment is production ready). Our partnership with NXP has never been better and together we can help you realize UIs that are beautiful, engaging, and highly performant. Our partnership with NXP has never been better and together we can help you realize UIs that are beautiful, engaging, and highly performant. Stay tuned for news on how we support the NXP i.MX 8 series of processors to get maximum UI performance on powerful, highly efficient boards. 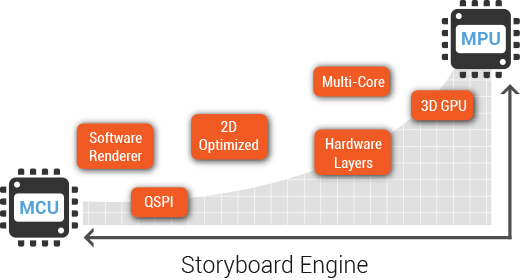 To learn more about Storyboard Suite, check out our latest on-demand webinars.